That's a really long title. Sorry about that. I thought I'd give a 30 day blog challenge a try. I wrote a post yesterday, so I already have a head start. In order to keep this thing manageable, though, I'm going to try to keep my posts really short and use a lot of pictures instead of my usual habit of using too many words (Faulkner was a favorite of mine in college). Someone clued me in recently that Harbor Freight carries canvas bags, called "Rigger's Bags". They make most excellent bags for carrying so many arty things on the inside. Since they are made of canvas, they also make an excellent surface for art on the outside. I don't know what "riggers" (whoever they are) carry in all the handy little pockets, but they are perfect for colored pens and pencils, erasers, water pens, White Out, washi tapes, ink pads and stamps. The inside is so roomy I could load it up with too much to carry if I'm not careful! When I carry my new art bag, I'm a happy camper. 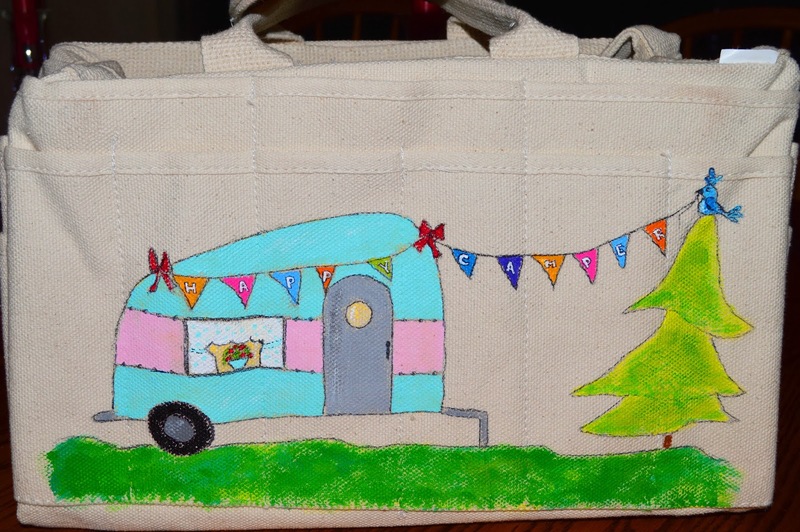 Here's my Happy Camper bag with one I made for a friend. She very sweetly let me have my way with it, which is my favorite way to do commissions. I'm not sure where the flower cat came from, but I really like him. He may show up again. You can find the riggers bag at a Harbor Freight near you. Won't your husband be surprised when you suggest a trip there!? 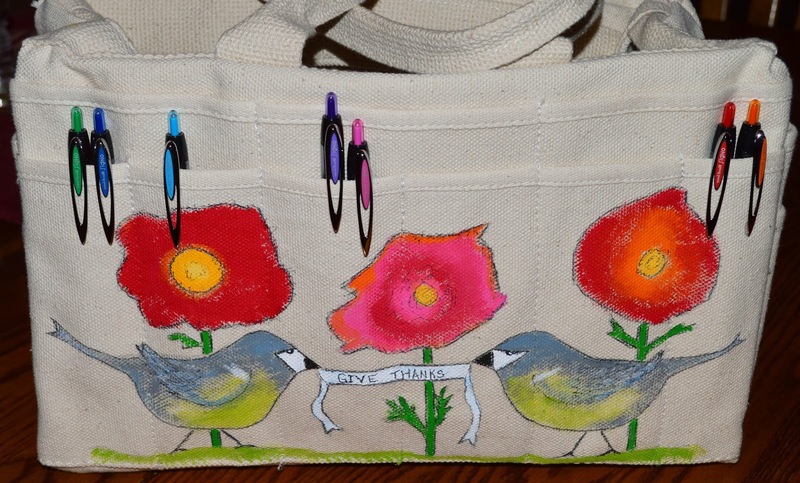 If you'd like a bag custom painted for you, I'd love to do that! Shoot me an email. Come back tomorrow for another installment of the 30-Day Blog Challenge. I haven't the foggiest notion what I'll write about, so we'll both be surprised. Until then, may the good Lord provide you a little sun on your face. So excited about the Etsy post and I will definitely watch for the episode. The rigger bags are so pretty. Love your art. It's inspiring.